UPSC Admit Card Civil Services 2018 Mains Exam - Download Now! 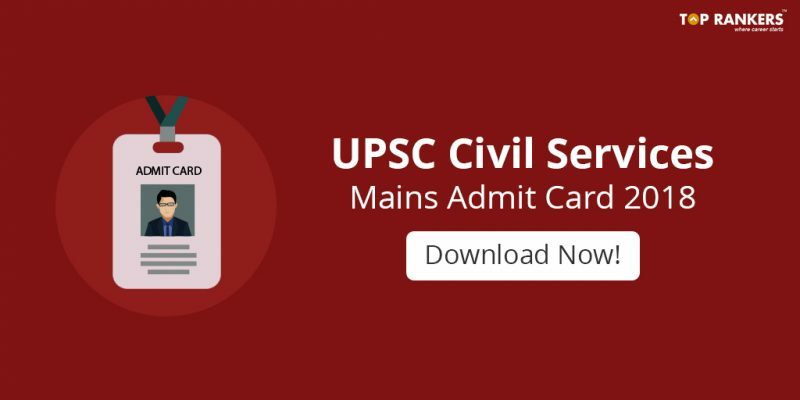 UPSC Admit Card for Civil Services Mains Exam 2018 – Get the direct link to download hall ticket and know more about the exam. First of all a big congratulations to all aspirants who have successfully cleared the Civil Services Aptitude Test (CSAT). Now its your turn to swipe past the UPSC Civil Services Mains Exam. We are sure, you are almost done with your preparation. A small tip- do not forget to revise. Revision is the best policy to get your preparation done. You have been waiting for the UPSC Admit Card for Civil Services Mains Exam 2018. Good News for you! The Admit card for Mains exam has been released and now you can download the Hall Ticket from the given direct link. The Civil Services Mains Exam is to commence on selected days from 28th September 2018 to 7th October 2018. Go through the article to avoid missing out any details related to the exam. Click on the direct link given above to download UPSC Admit card 2018. Read through the instructions provided and take a print of those. Then type your Password or Date of Birth. Type in the Captcha Code in the given format. Take Print out for reference. Note: You have to carry a copy of your passport size photo (same as in the admit card), one for each session in case you do not have a clear photo in the admit card print out. Also, you have to keep a black ball point pen for making entries in the exam. Please reach the exam center one hour before to avoid uncertain circumstances. So, tell us, did you find our post on UPSC Civil Services Mains Admit Card 2018 helpful? Then, keep visiting us regularly for more admit card updates. And do share your thoughts with us in the comments section below.